The transformation of Edmonton’s Brewery District is giving a nod to the past as First Capital Realty begins the renovation and restoration of the 104-year-old Molson Tower. The iconic, and disproportionately large, revolving Molson sign on the top of the 85-foot-tall tower was removed last week to allow work to proceed on the red brick building. The sign, which dates from 1958, won’t be going back up but a replica that “will stand out” will re-top the building, slated for completion by mid-year 2018, says Ralph Huizinga, First Capital’s vice president of acquisitions and development for western Canada. 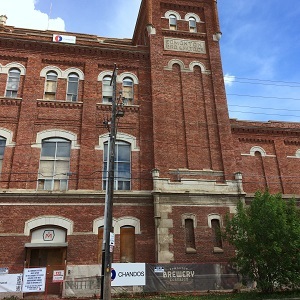 Edmonton’s Brewery District is a mixed development on property once owned by Molson and a large car dealership west of the city’s downtown core. It is a joint venture between partners and co-owners First Capital and Sun Life. First Capital — a Toronto-based urban retail property owner and operator — is the development, leasing and property manager for the district, which upon completion will include 350,000 square feet of space. The red brick buildings of the district, inspired by the architecture of the Tower, surround parking and drive-through and pedestrian routes. Tenants already open include a Loblaw City Market, a 40,000-square-foot Goodlife Fitness Centre, Shoppers Drug Mart, Mountain Equipment Co-op and several restaurants and eateries. When the renovation is complete the historic Molson Tower building on the northwest corner of the development at 121 Street and 105 Avenue will house a micro brewery in the basement and a restaurant and off-sales retail facility on the main floor. Molson will partner with restaurant company Six Pints on the restaurant, says Huizinga. First Realty’s own Edmonton offices will occupy the top two floors of the slim tower, moving from current offices in the north of the city. Huizinga says front-runners for the remainder of the office space in the building are a financial management company and medical services tenants. The building itself is not huge — the main and second floor are each 7,200 square feet and the slim tower above narrows to between 800 and 900 square feet on the top floors. There are five floors plus the basement which will house the microbrewery. The tower project has had its challenges for First Capital, which is known for developing, owning and operating urban retail and mixed-use properties across Canada. Its portfolio includes 160 Canadian properties encompassing 23.8 million square feet of gross leasable area with a total enterprise value of $9.1 billion. Although the firm has experience with some historical reconstruction in Toronto and Calgary, those projects weren’t on the scale of the Molson Tower. The renovation will cost $14 million, Huizinga says. The city of Edmonton deemed $8.4 million of that cost to be eligible for special heritage grants and it will kick in $4.2 million toward the development. The building also qualifies for a provincial heritage program which will pay up to $100,000 per year for restoration and maintenance of historic elements of the building. The portion of the renovation costs not deemed historical include a link building, which includes elevators and maintenance equipment to service the tower structure. The restoration isn’t the final brick in the Brewery District project, says Huizinga. There is still a restaurant building to complete and the southwest corner of the district, on the main 104th Avenue corridor, remains up in the air. Huizinga hopes to see construction started on the final pieces of the district by spring 2018. The details of the development have shifted somewhat since the original plans for the Brewery District, admits Huizinga. The fast-paced building of office skyscrapers around the new Rogers Place Arena had an effect on First Capital’s plan. But the Ice district should also be a boon for the Brewery District. Huizinga says the high percentage of restaurants in the development are partly supported by the high density neighbourhoods bordering the district, but also by its proximity to the Ice District and the Arena – about 15 blocks to the east. That means the area should develop into a pre-stop for consumers heading to arena events, particularly since there will be a stop in the middle of the district on the western leg of the Edmonton’s Light Rail Transit western line when it is eventually built.